My usual Saturday routine during growing season centers on a luxurious walk through the Lexington Farmers Market, shopping bags filling and finally almost dragging as my cash supply lightens, then vanishes. Last Saturday, though, I stepped out on my main market squeeze and visited Louisville's lovely Douglass Loop Farmers Market. The purpose was honorable: research for my second book, this one focusing on some favorite Kentucky summer foods and the people who grow them. Douglass Loop Market seemed at once familiar and exotic. Several Lexington Farmers Market vendors also sell at Douglass Loop: Boone Creek Creamery, Garey Farms, Quarles Farm, and, in a smart swap, Stone Cross Farm offering Blue Moon Farm garlic scape pesto and goodies, while back in Lexington Blue Moon sells Stone Cross Farm's bacon, other pork, and Cloverdale Creamery cheeses. 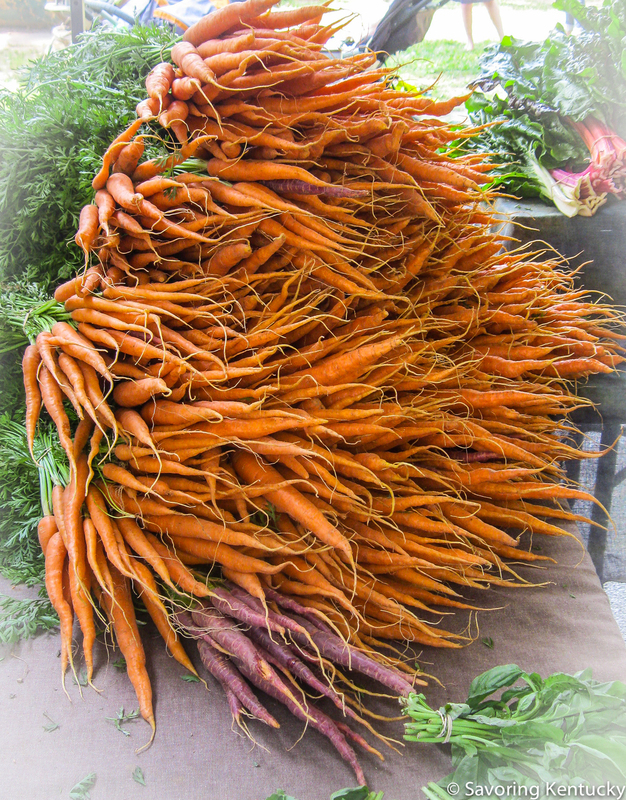 On the other hand, I rarely see abundant carrots at the Lexington Farmers Market, or fermented foods, fudge, essential oils, native plants, ferns, or microgreens. Both markets boast good crowds, fine foods, committed growers, and zillions of phyto- and animal nutrients. Hungry-and-thirsty-right-now Lexington Market patrons can choose from tender savory or sweet crêpes from La Petite Crêperie (now including gluten-free crêpes! ), tender, Kentucky-flavored scones from Wildflour Scones & Tea, memorable breakfast burritos and fried green tomato sandwiches dripping juicy, crispy local ingredients at Cookin' Up Kentucky, and liquid morning happiness from Caffe Marco and Magic Beans. Several vendors offer home-baked goods. At Douglass Loop, I spotted prepared foods at an Asiatique booth, a taco truck, Wiltshire Pantry, and more. The two markets are more similar than different, except for setting. Douglass Loop Farmers Market nestles into a shady grove. If a storm blows up—and it will, as we know from the past week—vendors and patrons can head into protective shelter in a nearby church. Real restrooms are available there, too. Fifth Third Pavilion offers some of Lexington's Saturday Market some weather protection, but no restrooms. It was great fun, visiting another fantastic Kentucky farmers market. For more photos, visit this little clickable photo gallery.